I will be touching on Technical analysis first since what most professional traders do is stare at charts all day and there must be a reason why the professionals are doing that. In fact, if you remembered, based on the Tutorial 2, many people believe that all available information in the market is reflected in the price. Hence, I will be touching on some simple technical analysis concepts now. I will not be touching on strategies yet, simply on the way to identify opportunities for profits. being pulled back down again. On the other hand, think of support like a barricade preventing the market from spiralling downwards. One thing to note is that support and resistance are not exact numbers and each trader has subjective support and resistance levels to the same chart sometimes. 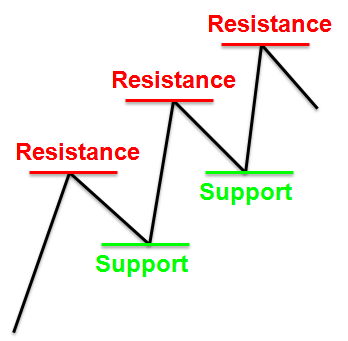 Resistance and support are constantly forming as the market moves. actually shows a 4 hour period. I strongly believe that in the next one month, the market will not move past this level. The green dotted line was my buy in price and I plan to take profits at 98.850 vs my buy in price of 98.704. This will net me a gain of 14.6 pips should my speculation turns out to be correct. I have no idea if the market is going to move the way I want but viewing the historical charts, the USD has been appreciating against the JPY. Also, the market has been bouncing up and down for the past 2 months. I am using very amateurish technical analysis, but my net profits in the past 2 days has actually reached 1%. The figure on the left actually shows the market testing the support level while the one on the right actually sees the market rising right back up afterwards. In the second figure on the right, if you have believed that the market was going down and sold your buy order, you could have made some real losses. In this case, its better to think of support and resistance as areas to take note of instead of actual numbers. If not, every time the market breaks the support level and you start selling, you will be making some serious losses. 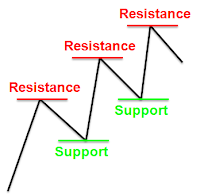 Support and resistance, in my opinion, is just a guideline to follow. Some websites and tutorials actually recommend using line charts to plot support and resistance because one can be misled by the highs and lows of the candlesticks. However, I think it is really up to ones preferences. For me, after looking at the benefits of candlesticks (more easing on the eyes and very clear), prefers to plot using candlesticks. Someone else could prefer bar chart or line chart. The market has tested the resistance several times and has not moved past it. We can call that the major resistance. All the other movements are minor support and resistance levels. If the market moves past a major support or resistance level, we can usually see a wave of volatility before the market stabilises again. In my opinion, it is best to trade a stable market for beginners like me so that more stability is ensured. In fact, you can generate a small and steady profits if you just stick to the stable markets. Most people burn their accounts by betting big. As traders, we do not let fear and greed influence our decisions, only the movements of the market and the indicators can tell us what is going to happen. Next lesson, we will touch on trend lines. A prelude to that would be the diagonal white line you see in the last figure on this tutorial.